As an ex Warrant Officer 1st Class from he NZ Army this course was exceptional in content and instructional ability A well organised and run course. I would like to personally thank you for providing such an excellent service and for facilitating our first aid for our staff. Your facilitator Scott was an absolute natural. He taught us, guided us and let us try things for ourselves. By doing this we gained so much more and learnt so much more than we have from previous First Aid courses from other organisations. Scott really made the course enjoyable especially knowing that we had been at work all day and were tired. He made us laugh and used great props and the course flew by because we were enjoying it so much. Thank you for adjusting the course so it was more relevant to our profession. We whole heartedly recommend your First Aid Training to anyone and everyone. Thank you and we look forward to using your service in the near future. Thanks again for getting me into the course at such short notice really appreciated. Of all the courses in first aid I have participated in (and there’s been a few) this set up was by far the most professional course but at the same time puts the trainee at ease by the relaxed learning environment. We have used Scott for our First Aid training for the past 2 years and have been very happy with his practical strategies and methods of delivery. Scott makes the course fun, interesting and is able to hold the attention of the staff for the full length of the course. I have always received positive feedback from the staff after the course, therefore will continue to use Scott for First Aid training at Sirromet Wines, as well as the other companies within our group. Firstly allow me to thank Wendy for her great class today my partner and I left feeling very confident and both feel we have learnt a lot with everything being explained in a way that was clear and not boring! We both now feel we could safely assist someone in an emergency (as much as we would prefer not to) and will now be more responsive and responsible new parents. We thank you Wendy for your vibrant, fun and very informative class today and wish the team at FAAE all the best with their future classes, we will always recommend your classes! P.S. the initial communication with FAAE was fantastic at no point did we feel uncomfortable about signing up with FAAE and all questions terms and conditions were very well laid out before attending, admin were great! Your friendly and personal but professional way of relating to people. For someone who is a visual learner, your way of teaching (with drama, props and laughs) is much more effective than other courses I’ve done. The calibre of trainers is fantastic. "The calibre of trainers is fantastic. Our team had a great experience…. we learned a lot and had a great time doing it." I will definitely be recommending this course! I would like to say a big ‘thank you’ to you both for the fantastic service you provided with the courses that both my Mum and I attended. From the phone call inquiry that I made, through to the day of the First Aid and CPR, your company was brilliant. My Mum was extremely worried about doing her First Aid and CPR, however by you offering her the manual to read prior, it eased her mind a lot! Both Scott and Ben were sensitive to my request asking for Mum not be on the floor and were extremely understanding. I appreciated the reminder texts and emails, and going out of your way to inform me/us of the limited parking due to the building being busy. The courses were fun, captured attention and educative. I have been updating my First Aid for 15 years, and this was by far the best course I have ever attended…..including when my Dad was teaching First Aid years ago! ? Thank again and kind regards. "Scott was AMAZING – He was such a good trainer and the course was really informative and presented in such a way that we all learnt SOOOOOO much!!!!!" 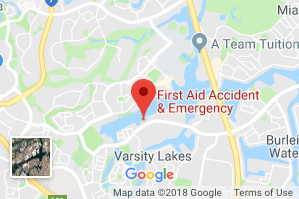 On behalf of Maquet, we would like to express a very big thank you to First Aid Accident and Emergency and Scott for your excellent professional service and training. All the staff at Maquet thoroughly enjoyed the training and all commented on how engaging and real to life Scott’s expertise are to train First Aid and CPR and what a top trainer Scott is. It’s always nice to receive positive feedback so, I thought I would share with you all at First Aid Accident and Emergency. Well done and will highly recommend in the future. “I attended First Aid training today with Scott. It is the best First Aid session I have been to in the past four years. Scott’s interactive style and evident passion for this work was so refreshing and enjoyable – and it worked. I now have renewed confidence in my ability to respond appropriately. Thank you so much Scott”. I just wanted to say that I have never had such an amazing trainer who made the day feel so relaxed, engaging, upbeat and enjoyable, we all got involved and had fun while learning. I feel I came away with more confidence than I have ever had about first aid and I’ve held my certificate since 2003. We will definitely be booking with Ben again in the future. 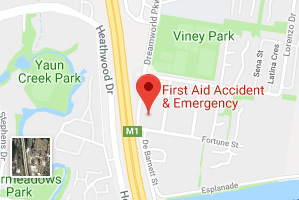 Our daughter & son have both recently completed First Aid Courses at your facility in Varsity Lakes and thought you would appreciate this good news story, along with “congratulations on providing a great job”…. Our daughter, Grace is studying nursing at Griffith University and works part-time at a pharmacy on the Gold Coast. Several weeks ago a man had a heart attack in her pharmacy, she immediately took control of the emergency, dragging him into a position away from obstacles and then commenced CPR whilst calling for her colleagues to get a defibrillator from a nearby medical centre. The medical centre refused to give it to the staff member, so another staff member returned & simply took it off their wall & ran with it. The paramedic that first arrived, one-up on the scene was surprised that Grace had such a control of the situation and asked her to continue whilst he intubated him. When further support paramedics arrived, Grace printed off the man’s medical history & gave it to them to take with them to the hospital. He had a heart condition – with surgical scars obvious when Grace ripped open his shirt. She had just come off a 2 week hospital placement at Robina Hospital, so she was in a comfortable place dealing with the person as a patient. Today, Grace received a message from the man’s family to say that after a long stay in hospital and a huge fight for life, he has recovered and has been sent home. With such a low success rate in these circumstances, we couldn’t be more proud & happy that our Grace saved this man’s life as a result of her First Aid Training. Congratulations again on the training provided to Grace, which supported her ability to perform First Aid to this man, who would definitely not have survived if it had not been conducted immediately and as proficiently as it was. "Staff are saying this is the best First Aid training course that they have ever taken, gaining more knowledge and real experience that if ever unfortunately needed would be applied to help save somebody's life." We conducted the HLTAID001 Provide CPR and HLTAID007 Provide Advanced Resuscitation at Benowa SHS this morning for AJ Presto and staff, they are about to go of to camp on a remote tropical Island and require the best skills and knowledge for a quick response. All the team were competent and thanked Scott and the team for their professional approach and live training. Learning CPR and Low voltage Switchboard Rescue with Dan the Sparky Man in Nerang and at our Varsity Lakes Training Centre. "The boys came back from their training the other day saying it was the best one they had attended yet! And this actually amazes me, considering they attend this training every.single.year (used to be twice a year as you would know) surely it should be boring to them by now? – guess that just shows how good Scott is at his job :)"
CPR training that is energised for the Sparkies and the Electrical industry at KW Electric in Yatala, do you need training that your team will remember? We went out to Pacific Pines SHS to train their Cert 3 in Fitness students for CPR and First Aid, this is what they said- "We learnt so much actually working on a person with CPR, thanks Scott and the team at First Aid Accident & Emergency"
FAAE visited the beautiful Camp Eden to teach the team CPR and First Aid, after 5 years they all still love the Live Scenarios! Team training in Low Voltage Rescue and CPR was well received by the team at Dreamworld, we wish all the staff and contractors a better 2017. "We trained all the team at the Brisbane Show Grounds in CPR and First Aid, they loved the LIVE training and the EKKA Bar room venue." We were contacted recently by SandSky Construction for a First aid and CPR training course in Helensvale. The 20 year old organisation wanted a fresh, fun and professional approach to first aid that could be delivered On-Site. One of our expert trainers delivered the course to them and the feedback was outstanding. "The best course they have ever done"
"The Trainer was funny, knowledgeable and most of all taught us what t do in this stressful situation"
"Scott delivered the training in a style that suited our organisation"
"It was so easy to organise them to come out"
"The best first aid course we have done, it was fun and we couldn't stop laughing. We covered the following accredited courses in 1 day- Provide CPR- HLTAID001, Provide First Aid HLTAID003 and Provide Emergency Care in and education and care setting HLTAID004 . The team here at FAAE have been looking after Rainbow Station Child Care in Casino - NSW for the past 8 years. We recently conducted training for the staff and they all loved our Fresh, Fun and Funky approach to first aid training. We recently had the pleasure of instructing all the doctors, nurses and admin staff here at Health HQ Southport in CPR and Advanced Resuscitation. This is a mandatory course for the staff to ensure they receive the CPD points for their accreditation. What did Health HQ say? "It was the best CPR and Advanced Resuscitation course we have ever done! It was really well suited to the practice and fit really well with our level of training!" One of our trainers, Josh Taylor, headed over to Commercial Solutions to instruct some of the staff in First Aid recently. What did Commercial Solutions say? "We all thoroughly enjoyed our training with both Scott and Josh. I have been participating in such courses for over 20 years and this was by far the best I have ever had the pleasure to be involved in. Please pass on my gratitude to the trainers for all their energy and effort in providing such an enjoyable and informative course. I will recommend you to everyone I deal with and will definitely be seeing you again next year for our refreshers." We recently trained the wonderful doctors and nurses at Carrara Medical Practice in CPR. What did they have to say? We recently visited Winderoo State School to provide training over 2 nights. The first night was CPR and the second night was first aid specifically targeted to school teachers. What did Windaroo State School have to say? Our Lead Facilitator, Scott Whimpey, recently headed out to St Agnes Catholic Primary School to conduct CPR training for the staff. What did they have to say about the training? We visited the Mantra Group of Hotels to provide First Aid and CPR Training for some of their Gold Coast resorts plus their Head Office. What did they think of the training? "Scott’s training is always innovative, interactive and engaging, we have used First Aid Accident & Emergency for over 5 years and they are brilliant. We even videoed some of the “live” scenarios and posted on Snapchat. All our management team learn so much in the sessions and have utilised these skills on numerous occasions. The training was put on for management and staff from Mantra, Salt, Twin Towns, Circle on Cavil and our head office." Our Lead Facilitator, Scott Whimpey, recently trained the combined forces of Coastline Electrical and Lindsey Electrical Services at Currumbin in CPR and Low Voltage Rescue. What did they have to say about our training? "We have trained in CPR and LVR with First Aid Accident & Emergency for over 8 years, they never cease to amaze us. This training session was the BEST one we have ever done; one of our guys also said he had done this training for over 40 years and the delivery, content and time frame of the LVR and CPR was the best he has ever done!" Our team trained a group from the dental industry, this was organised by the OMS Clinic in conjunction with Gold Coast Private. "The simulation of real life situations made this the best CPR course we have ever done"
We practice all the areas of the medical and dental speciality of Oral & Maxillofacial Surgery encompassing problems involving the teeth, jaws and face. We also sub-specialise in the fields of Head & Neck Cancer Surgery and Facial Reconstructive Surgery. We are available to consult patients from the Gold Coast, Southern Queensland and Northern New South Wales regions. Dan and his team have now been training with us in Low Voltage Rescue and CPR for the past 10 years! Every time they come in they really get a lot out of the course and look forward to updates we provide for them from the Electrical Safety Office (ESO). So, what did Dan have to say about our training? We recently trained the teaching staff at Assisi College in Upper Coomera, we had two groups training in CPR and first aid, and every teacher felt confident in their skills by the end of the day. "We learnt so much in the CPR course, baby and adult CPR, choking, insect bites, snake bites, tick removal and treatment, treating an unconscious patient, defibrillator training, moving a patient, spinal log rolls and so much more. It was great." We recently had a refresher session with Airey Electrical, where the team revised CPR and low voltage rescue exercises while learning a few new techniques along the way. It's important to take a refresher course each year, not only to update your certification, but also to keep on top of any new information. The boys at Airey Electrical realise this, they've been training with us for 10 years now! Left: The guys at Airey Electrical had a great time and learnt some life-saving techniques along the way. "FAAE never disappoints us, we've been with them for a decade and every year, we actually use the techniques we learn and Scott always knows how to make it a bit of fun and a laugh at the same time." If your workplace needs training in low voltage rescue or CPR, we are more than happy to provide. We do in-house and on-site training and are happy to cater to the needs of any clients. Contact us today for any enquiries or check out the course page for more info. Thank you for giving the chance to give our feedback on the training. Scott was terrific and all participants went out of their way to mention how enjoyable and informative the course was. We recently visited the staff at Moreton Bay Boys College to deliver CPR and First Aid training. An amazing group of people that are armed with the knowledge of how to save a life! "The practical aspects teach more than just theory - it's a great approach! We look forward to this course as Scott makes it so fun!" If your workplace needs training in First Aid or CPR, we are more than happy to provide. We do in-house and on-site training and are happy to cater to the needs of any clients. Contact us today for any enquiries or check out the course page for more info. We recently visited the staff at Pacific Pines State High School to deliver CPR and First Aid training. We covered a wide range of situations and incidents that could happen and you should always be prepared for - some more out there than others! We recently visited QLD Parks and Wildlife to deliver First Aid training. We covered a wide range of situations and incidents that could happen and you should always be prepared for. Today, we trained the electricians at Carlton United Breweries in Yatala in Low Voltage Rescue and CPR. They have been training for over 20 years and say that this has been "the best course they have ever done"! Last night I participated in a refresher course for CPR and advanced CPR with Garry as our instructor. I would like to acknowledge the fantastic way Garry ran the course and the professionalism shown. His knowledge, skills and experience were exceptional which created an interesting and engaging experience. I thoroughly enjoyed my experience on the course and ask that this be noted to management. "I enjoyed the practical way of teaching and all the scenario examples. Very fun and entertaining way to learn First Aid as well as having additional information and details on the ‘why’ behind the instructions was great." "The course was very believable and knowledgeable. Having so much practice makes it easy to learn and I feel I have learned a lot." "Scott made a serious subject entertaining and easy to understand." "Fantastic [course]! I have done a lot of these and this was one of the best I have been through in 50 years." We recently trained the staff at Arcadia College, Varsity Lakes, in First Aid. What did they have to say about us? "This is the best First Aid Course we have ever done. There were interactive and fun scenarios all while learning some great skills on how to help a student in need!" We were proud to deliver an action packed First Aid and CPR session to the wonderful team at The Advanced Group. They loved our course so much, they booked all their staff in! Contact us on 07 5520 5068 to organise onsite training for your staff with one of our experienced and charismatic team members! "Just feedback on how awesome our training was with Scotty on Monday. I’ve been here for 7 years and have been to a few training sessions. I was working 'til late Sunday night and was dreading coming to the training. Scotty had real situations happening which made a huge difference than just sitting watching slides all day. Hopefully we will always get him back again. Thanks again to the fantastic team! I was referred and highly recommended by a staff member at the child care centre I work at to attend your first aid training centre. I attended the first aid course at the Varsity training centre on Saturday 11 August. It was a fantastic, funny, fabulous first aid course! Simple! Straight forward! Super! Jokingly Josh presented an amazing and great training session all day! Highly, highly recommend to others! More confident than ever! I am so looking forward to attend next year when I need to renew my CPR and many years to come! We had the privilege of training the wonderful staff at Opal Aged Care in First Aid and CPR. "This was the best training we have ever done and we loved all the practical aspects!" "Gary was excellent! At last, someone has taught us what we need to know and not a heap of stuff we will never use! It also helped that he had work history in the medical world. I have attended three first aid courses with your company and this was by far the best!" I would just like to let you know that 2 days after I completed my first aid course with Josh, my landlord, who lives on the same property, had a heart attack. Although we didn't have to do CPR I felt more at ease knowing what to do. I remembered Josh's four types of patient and acted accordingly until help arrived. It made my course so worthwhile and I remembered everything Josh taught us. I was going through it in my head just in case I had to step in and do CPR. Thankfully he is in hospital and doing OK.
Again, thank you for giving me the skills to help my fellow human being. We recently trained the kids at Arcadia College in First Aid! "Thank you! The First Aid Course with Josh Taylor was fantastic. He did so well with our kids. He was engaging, informative and fun." To organise one of our trainers to come out to your place of business to provide group training, please give us a call on 5520 5068. "The best CPR training I’ve ever done." "The best CPR and First Aid class I have ever attended! The staff are very knowledgeable and professional, but also engaging and made the courses fun! Thanks!! I attended CPR training this morning with First Aid Accident and Emergency located at Varsity Lakes. This training is one of the best sessions I have attended and I have recommended we stick with you as a provider going forward. The presenter Wendy was entertaining and dynamic with excellent practical knowledge and great theatrical skills. This form of teaching promotes good outcomes whereby I was attentive for the entire session and have picked up more than I have with any other CPR provider in the past. CPR Awareness for ZUMBA Gold!